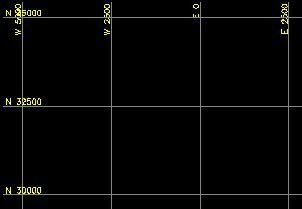 Do you ever get tired of the redundant task of creating a Northing/Easting grid for your drawings in AutoCAD? Here's a solution that will reduce this pain staking task to a single command which executes in less than a minute. Samples of (a) Grid of Ticks and (b) Grid of Lines. North/East Grid automatically creates grid labels. 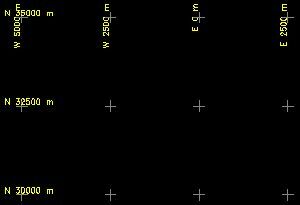 Negative coordinates are assumed to be West or South. Let's have a look at the North/East Grid Generator's interface dialog. Just 5 steps (as depicted below), and hit the "Create Grid" button, it's as easy as that. Version 2.0 includes a "Delete old grid" feature which is really handy when changing grid parameters. CADmentor.com is proud to offer time saving tools for Computer Aided Drafting (CAD) users. Engineers, designers, and draftsman in the civil/structural engineering industry can find helpful AutoCAD macro programs to increase productivity. We have a selection of unique and powerful tools available for CAD users to download. This download contains a .NET compiled DLL plug-in specifically designed for AutoCAD. 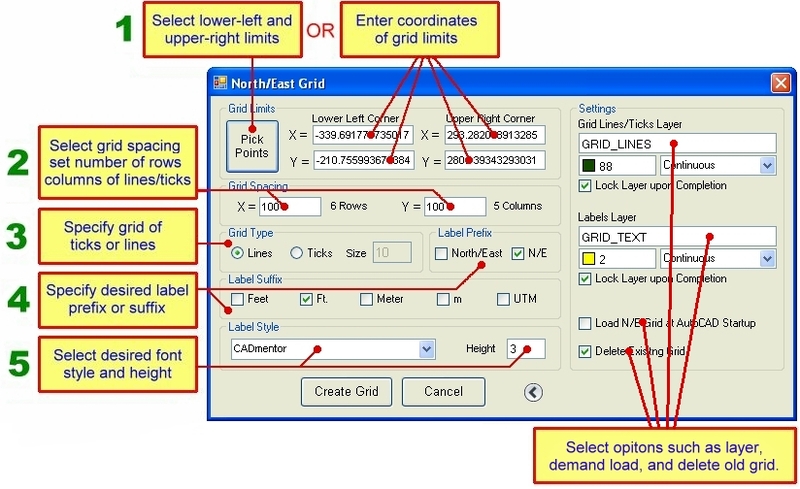 The demand load feature allows North-East Grid to automatically load every time AutoCAD starts, making it a easy to use addition to the normal AutoCAD command set. Installation is a breeze using a windows setup program. This download also contains a VBA version (for AutoCAD 2009 and earlier). The use of AutoCAD plug-ins requires workstation administrative privileges.